WHEN two planets in the sky come together, forming the conjunction aspect, it signifies that the things on earth ruled by these two planets also have come together in such a manner as to influence world affairs, national affairs and the affairs of cities. The type of influence exerted depends upon the type of energy radiated by the two planets involved in the aspect; and its harmony or discord depends upon the friendliness or enmity of the two planets forming the conjunction, and the way they are aspected at the time by the other planets. To be more specific: if Mars is one of the planets in the conjunction, events are influenced by machines, manufacturing, industrial workers, soldiers and such things as are ruled by Mars. And because that is the type of influence of the Mars vibration, what comes to pass will involve accident or strife. If Jupiter is the other planet in conjunction, affairs are influenced by treaties, commerce, business, money, religion and the other things Jupiter rules. And because the vibrations of Jupiter are of that type, abundance of something and a tendency toward expansion will be involved. On the other hand, if Saturn is the other planet making the conjunction, conditions will be influenced by the farmer, the miner, the common laborer, lands, mines, basic utilities, conservatism, and such other matters as Saturn rules. And because Saturn’s vibrations are of that type, selfishness, greed, contraction and lack will be involved. Not all the affairs of national life will be affected profoundly by the conjunction of two major planets. The house of the chart, erected for the time of the conjunction, in which the conjunction falls indicates a department of life strongly influenced by the coming together of the two groups of factors. And how the converging affairs influence other departments of life is shown by the aspects to other planets in the chart, their house positions and rulerships revealing the departments of life affected. Powerful aspects from the conjunction to other planets show, by the house positions of those planets, the departments of life chiefly affected. The nature of the aspect, and the planet aspected, indicate in what manner the department of life is affected. When the planets form aspects in the sky, the union of their energy streams produce whirls and vortices which increase the power of these planetary energies to influence the unconscious minds of men. Within the astral body of each individual are groups of thought cells which act as receiving sets for the energies broadcast by each of the ten astrological orbs. The position of a particular planet in the birth chart maps the place within the unconscious mind where are located the thought cells which act as a natural receiving set for the vibrations of that planet. When, therefore, this planet is powerfully aspected in the sky, the unconscious minds of people in general are more noticeably influenced by its trend; not because they are more receptive to this planet’s energies, but because this planet’s energies reach them much more vigorously. More energy then is added to the thought cells mapped by the planet in their birth charts, and because these thought cells thus acquire a more than normal activity, they take a more prominent part in determining the thinking, the behavior and the type of events which are attracted. Furthermore, due to the birth charts of nations and other groups, the receptivity to planetary energy reaching the earth during a given period, is not the same in all areas on the globe. Nations and cities, as indicated by progressed aspects and by the Conjunction Charts and Cycle Charts, vary in the degree of their receptivity to a given planetary stream. 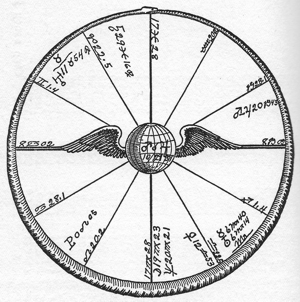 An aspect between planets in the sky, such as a Conjunction, broadcasts the same energy to the unconscious minds of all men; but the people in one country may be particularly receptive to it, while the people of another country may have so completely tuned in on another planetary vibration as to notice it hardly at all. It is the function of the Birth Charts, Progressed Aspects, Cycle Charts and Conjunction Charts used in mundane astrology to indicate the degree of receptivity of each important area of the earth to whatever energies are being broadcast from the sky. All people within a group, however, are not equally receptive to what at the time is being broadcast from the sky; no more so than are all nations. Some individuals within a group may tune in scarcely at all on a given planetary vibration, while a few members may pick up its energies in tremendous volume. And it is these members of the group who respond markedly to a particular planet’s vibrations who largely determine the effect of the particular energy upon the group. Those having the planet prominent in their charts of birth are more responsive to its vibrations than are those who do not thus have it prominent. 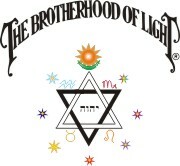 That is, they have thought cells within their unconscious minds which act as natural receiving sets for this energy. But to pick up the planetary energy, radio fashion, in most volume, there must be at the time, a progressed aspect to that planet in the birth chart. Such a progressed aspect forms an aerial which readily picks up the energies of the two planets involved. This energy is thus conducted immediately to the thought cells mapped in the birth chart by the planets. And these thought cells, acquiring so much new energy of their own type, powerfully influence the individual’s thinking, his behavior and the events which at that time come into his life. In Brotherhood of Light Research work we have had ample opportunity to work out the progressed aspects in the charts of those individuals whose activities were chiefly responsible for the effect produced upon a nation or a city by the heavy aspects present at the time in the sky. And we have found that such individuals had the aspecting planets prominent in their birth charts, and that at the time there was a major progressed aspect to one or both of them. Other aspects in the sky than conjunctions, particularly the heaviest aspects of the more slowly moving planets, have a noticeable affect upon the affairs of cities, nations and the world. And a chart erected for the city or capitol of the country, for the exact time the aspect is perfect, will give much information as to the department of life chiefly affected by the aspect there. 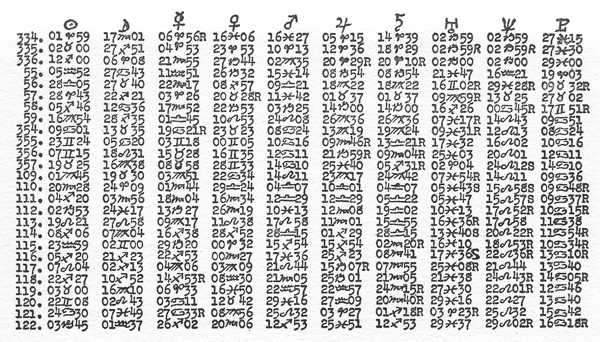 Since 1900 the exact Greenwich Mean Time of such aspects is given in the back of Raphael’s Ephemeris. All the difficulties anticipated from the opposition of Saturn to Neptune in the sky on January 17, 1937, came to pass. Neptune was in Virgo, the harvest sign; and the citrus growers in California were beset with the severest cold in the history of the industry; while Saturn in Pisces, the sign of rivers, brought floods in the Ohio Valley of unprecedented destructiveness. The hopes for peace agreements in Europe broke completely down; the Japanese cabinet was forced to resign by the military crowd for the first time in history; and in Russia thirteen prominent men were executed, allegedly for attempting the overthrow of the government. The shipping strike at that time was still under way in the U.S., and to this labor difficulty was added the General Motors strike, and the typically Pluto technique of its sit-down strikers. On April 22, 1937, Jupiter came to the opposition of Pluto: Clark Gable, popular moving picture star, who had been the subject of an extortion (Pluto) plot, was called by the government as a witness. For a week the newspapers of the nation gave the Extortion Trial, as they called it, tremendous publicity. The verdict, convicting the woman on trial as guilty of mail fraud, thus attempting to get money (Jupiter), was brought in by the jury on April 23. On April 22, 1937, there were no less than a dozen major strikes in progress, some of the sit-down (Pluto) variety, and the C. I. O. came into unprecedented prominence. April 20, 1937, the newspapers chronicled that 27 nations had combined (Pluto) to place a sanitary cordon of warships (Pluto resorts to force) around Spain. And April 23 bears the headlines that London and Paris had formed an alliance for mutual defense. Jupiter was again opposition Pluto on May 29, 1937, and on December 18, 1937. Each of these aspects, close to the dates indicated, brought outstanding conflict (opposition aspect) between the Administration of the U. S. and Big Business (Jupiter); the last one also a marked Business (Jupiter) Recession, with the Government demanding; that Labor and Business cooperate (Pluto). And each brought outstanding conflict between the two great labor organizations; the C. I. O. and the A. F. of L., and effort on the part of the Government to get these contending factions to cooperate. December 12 occurred the malicious and intentional sinking of the American warship, Panay, and three Standard Oil tankers, accompanied by loss of life and machine gunning of survivors, by Japanese bombing planes. By December 18 there was grave danger of war between Japan and the U. S.; and this international incident led to a close cooperation between the U. S. and British navies. The strife was over the attempt of the U. S. to protect her commercial (Jupiter) interests in China. Such aspects in the sky have some influence during the time they are forming and during the time they are separating over an orb of the same number of degrees that is allowed for the same aspect in a birth chart. In this they are quite different in their influence than the aspects made by progression in a Cycle Chart, which, with the exception of the so swift moving Moon, affects the event only during the time the aspect is within one degree of perfect. And, just as in birth charts, aspects in the sky have an influence during the time they are within several degrees of orb, even though the aspect is not completed for a long time. For instance, in September 1937, Uranus was Taurus 13, Neptune was Virgo 18 and Jupiter was Capricorn 17. They thus were in a Grand Trine. But Uranus was retrograde and did not complete the trine with Neptune that year; and Jupiter before reaching the trine of Neptune turned retrograde, and did not complete it until the last of October. Yet this Grand Trine was noticeable in all the fields these three planets rule. Neptune is the planet of the movies, Uranus is the planet which has to do with new things, and Jupiter is the planet of patronage. In September 1937, a new type of movie was presented to the public. In the picture, One Hundred Men and a Girl, for the first time in screen history, undiluted classical music was joined in dramatic unity with the comedy, pathos and suspense which go to make a great picture. And it was a box office (Jupiter) success. Under this aspect also, to determine to what extent a telepathic (Pluto) sense exists capable of use by the general public, the radio facilities of the National broadcasting Corporation were employed by the Zenith Foundation of Chicago, in comprehensive tests, and in giving to the public authentic instances in which occult powers, not recognized by material science, have been used. What has been said of the other aspects that form in the sky is equally true of major conjunctions. They have an influence not merely over the limited period of time while the two planets are within one degree of the perfect conjunction, but all the while the planets making the conjunction are as close to each other as the common orb allowed for their conjunction in a birth chart. The exact moment of the conjunction, which is the time for which the conjunction chart should be erected, is merely the peak of the influence. Yet the influence of the conjunction upon events can be discerned in a pronounced manner near this time of the exact conjunction. Such a conjunction is a distinct astrological influence. But the more energy of a given planet present at a certain time, the more work it can do. Therefore, if while the conjunction aspect is within orb of influence, some pronounced aspect by progression forms in the Cycle Chart of one of the two planets; or if in some Cycle Chart one of the planets involved in the conjunction is powerfully aspected by progression, there is enough planetary energy of a particular kind present to attract an event of the nature of the conjunction on that day. Therefore, in determining the exact days on which the chief events indicated by the conjunction will occur, the various Cycle Charts should be inspected, to ascertain when there is an unusual supply of planetary energy present of the kind indicated by the Conjunction. Whether the accessory energy shown by the progressed aspect in a Cycle Chart is harmonious or discordant is not so important. The general rule is that the chief events occur on those days when there is the most planetary energy of the given kind reaching the earth. 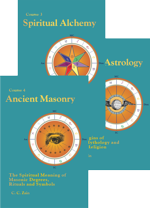 The most effective method of becoming skilled in astrology is the case method, by which the student, after gaining some knowledge of theory, studies actual cases in which astrological positions have resulted in recorded events or conditions. It is my advice that students of mundane astrology copy off on blank charts all the various Cycle Charts and Conjunction Charts given in this course of lessons, and study them in view of what has been recorded relative to the events which they have influenced. Astrological forces often do not work in just the manner those inexperienced expect. In the study of Major Conjunctions, this course offers 76 charts already erected, embracing examples in proper sequence of all 15 different types of Major Conjunctions, with at least some comment on the event or events attracted by each. Progressed aspects to the positions in the Conjunction Charts should be ignored; but the houses containing planets powerfully aspected by the Conjunction should receive special consideration. 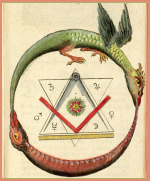 For finding the time of day an aspect is completed, including the conjunction, Rule XI of Chapter 5 (Serial Lesson 111), Course X-II, Progressing the Horoscope, may be used; and the time of all conjunctions here given earlier than 1900 has been calculated by that rule. 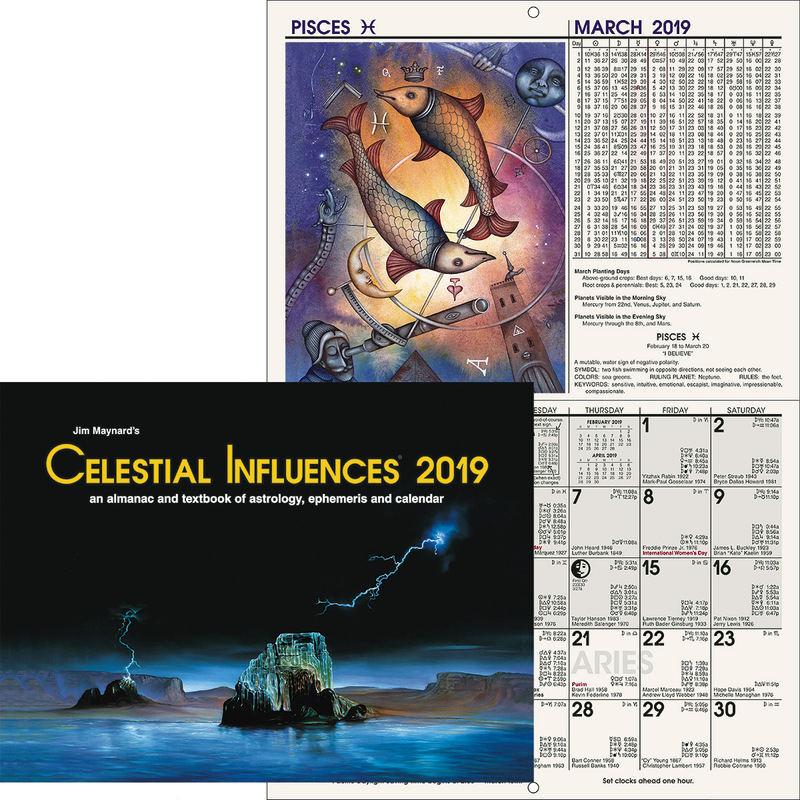 Since 1900 the precise time of all aspects between the planets, including the conjunctions, are given in the back of Raphael’s Ephemeris; and the time of all conjunctions here given since 1900 has been ascertained from this source. As dates before 1920 are taken from the Reference History of the World of Webster’s New International Dictionary, in which only a few events are given for each year, the events cited are not so close to the dates of the conjunctions as are those since 1920, which are taken from the WORLD ALMANAC, in which one event or several is given for nearly every day. To accommodate so many conjunctions, it was found more convenient to distribute their charts in tables to be found in several chapters/lessons of this course. The prefix number here given refers to the number in the table, the chapter/lesson number of the lesson in which the table may be found comes next, and this is followed by the data for which the chart was erected, and the event which coincided with the conjunction. As Pluto rules groups, cooperation, the splitting into two opposing factions, and the exercise of dictatorial powers; and Neptune rules visionary schemes, involved affairs, involuntary servitude and dramatic art; the conjunction of Neptune with Pluto attracts events in which factors related to both planets are combined. 332. Neptune conjunction Pluto, July 22, 1891, approximately 10:24 p.m. L.M.T. 77W. 38N56. The event is given in Chapter 2 (Serial Lesson No. 142). As Pluto rules groups, cooperation, the splitting into two opposing actions, and the exercise of dictatorial powers; and Uranus rules independence, reform, exposure, invention and the new and untried; the conjunction of Uranus with Pluto attracts events in which factors related to both planets are combined. 331. Uranus conjunction Pluto, June 20, 1850, approximately 6:52 a.m. L.M.T. 77W. 38N56. The event is given in Chapter 2 (Serial Lesson No. 142). As Neptune rules visionary schemes, involved affairs, involuntary servitude and dramatic art; and Uranus rules independence, reform, exposure, invention and the new and untried; the conjunction of Uranus with Neptune attracts events in which factors related to both planets are combined. 334. Table at end of this chapter/lesson, Uranus conjunction Neptune, March 22, 1821, approximately 5:09 p.m. L.M.T. 77W. 38N56. Russian ukase (abrupt action leading to involvement) claiming coast south to 51 degrees and exclusive rights in North Pacific Ocean and Bering Sea (five planets in seventh, square Uranus-Neptune in house of territory). 335. Table at end of this chapter/lesson, Uranus conjunction Neptune, April 22,1821, approximately 6:52 a.m. L.M.T. 77W. 38N56. Supreme Court reasserts appellate jurisdiction (involving the rights of states; Uranus ruling the house of government). 336. Table at end of this chapter/lesson, Uranus conjunction Neptune, December 4, 1821, approximately 4:52 a.m. L.M.T. 77W. 38N56. Monroe sends message to Congress advising the recognition (independence) of the Spanish-American states (Mars in house of business and honor, trine Uranus-Neptune). As Pluto rules groups, cooperation, the splitting into two opposing factions, and the exercise of dictatorial powers; and Saturn rules safety, economy, poverty, lands, minerals, basic utilities, buildings, crops on the land, destruction by storm, the miner, the farmer and the common laborer; the conjunction of Saturn with Pluto attracts events in which the factors related to both planets are combined. 337. Chapter 4 (Serial Lesson 144), Saturn conjunction Pluto, June 5, 1851, approximately 11:46 a.m. L.M.T. 77W. 38N56. March 3, 1851, Congress reduces (Saturn) letter postage to three cents per half ounce (letters have mass circulation). 338. Chapter 4 (Serial Lesson 144), Saturn conjunction Pluto, May 21, 1883, approximately 0:52 p.m. L.M.T. 77W. 38:56M. March 3, 1883, Tariff and Internal Revenue Act to reduce (Saturn) surplus. 339. Chapter 4 (Serial Lesson 144), Saturn conjunction Pluto, September 30, 1914, approximately 3:17 p.m. L.M.T. 77W. 38N56. September 2, 1914, Bureau of War Risk Insurance (safety for shipping groups) is authorized as part of the Treasury Department. 340. Chapter 4 (Serial Lesson 144), Saturn conjunction Pluto, November 4, 1914, approximately 2:41 p.m. L.M.T. 77W. 38N56. November 2, 1914, Federal quarantine is proclaimed to prevent (safety) the spread of hoof-and-mouth disease among cattle in many (groups) States. 341. Chapter 4 (Serial Lesson 144), Saturn conjunction Pluto, May 19, 1915, approximately 9:58 a.m. L.M.T. 77W. 38N56. As Neptune rules visionary schemes, involved affairs, involuntary servitude and dramatic art; and Saturn rules safety, economy, poverty, lands, minerals, basic utilities, buildings, crops on the land, destruction by storm, the miner, the farmer and the common laborer; the conjunction of Saturn with Neptune attracts events in which factors related to both planets are combined. 100. Chapter 4 (Serial Lesson 144), Saturn conjunction Neptune, December 1, 1809, approximately 9:57 a.m. L.M.T. 77W. 38N56. September 1809, first experimental railroad in America (Neptune promotion), built by John Thomson in Delaware County, Pennsylvania. 101. Chapter 4 (Serial Lesson 144), Saturn conjunction Neptune, April 4, 1846, approximately 1:20 a.m. L.M.T. 77W. 38N56. March 28, 1846, Taylor’s force occupies the strip between Nueces and Rio Grande (involved condition over Texan boundary). 102. Chapter 4 (Serial Lesson 144), Saturn conjunction Neptune, September 4, 1846, approximately 9:16 p.m. L.M.T. 77W. 38N56. August 18, 1846, Kearny, after an overland march, occupies Santa Fe (acquires territory of New Mexico). 103. Chapter 4 (Serial Lesson 144), Saturn conjunction Neptune, December 10, 1846, approximately 7:58 p.m. L.M.T. 77W. 38N56. December 12, 1846, Treaty of Granada: freedom of transit on Isthmus of Panama given to United States (safety). 104. Chapter 4 (Serial Lesson 144), Saturn conjunction Neptune, May 12, 1882, approximately 9:41 a.m. L.M.T. 77W. 38N56. May 6, 1882, first Chinese Exclusion Act suspends immigration of laborers for ten years (protecting American laborers). 105. Chapter 4 (Serial Lesson 144), Saturn conjunction Neptune, August 1, 1917, 0:04 a.m. L.M.T. 77W. 38N56. August 10, 1917, Food Control Act gives the president very wide powers in fixing prices and regulating the distribution of foodstuffs and fuels (a safety measure). As Uranus rules independence, reform, exposure, invention and the new and untried; and Saturn rules safety, economy, poverty, lands, minerals, basic utilities, buildings, crops on the land, destruction by storm, the miner, the farmer and the common laborer; the conjunction of Saturn with Uranus attracts events in which factors related to both planets are combined. 106. Chapter 4 (Serial Lesson 144), Saturn conjunction Uranus, November 16, 1805, approximately 6:52 a.m. L.M.T. 77W. 38N56. March 29, 1806, policy of internal improvement at Federal expense is inaugurated (development of natural resources) by an act authorizing the National Road between the Potomac and the Ohio. 107. Chapter 4 (Serial Lesson 144), Saturn conjunction Uranus, March 15, 1852, approximately 6:52 p.m. L.M.T. 77W. 38N56. May 27, 1852, the court discountenances a bridge across the Ohio River, under State law, as being an obstruction (Saturn) to undisturbed interstate or foreign commerce. 108. Chapter 4 (Serial Lesson 144), Saturn conjunction Uranus, January 6, 1897, approximately 2.52 p.m. L.M.T. 77W. 38N56. March 2, 1897, Cleveland vetoes a bill for a literacy test of immigrants (designed to protect American laborers). As Pluto rules groups, cooperation, the splitting into two opposing factions, and the exercise of dictatorial powers; and Jupiter rules finance, commerce, interstate commerce, treaties, arbitration, the courts, salesmanship, publishing, advertising, cable messages, ships which travel the sea, long journeys, religion and public expressions of opinion; the conjunction of Jupiter with Pluto attracts events in which factors related to both planets are combined. 342. Chapter 5 (Serial Lesson 145), Jupiter conjunction Pluto, May 5, 1845, approximately 2:27 p.m. L.M.T. 77W. 38N56. March 1, 1845, joint (Pluto) resolution of Congress for the annexation of Texas (Jupiter-Pluto sextile Saturn), less favorable to the United States than the abandoned treaty (Jupiter). 343. Chapter 5 (Serial Lesson 145), Jupiter conjunction Pluto, June 11, 1857, approximately 0:46 p.m. L.M.T. 77W 38N56. August 24, 1857, panic (financial and affecting the masses) of 1857 begins. 344. Chapter 5 (Serial Lesson 145), Jupiter conjunction Pluto July 25, 1869, approximately 7:37 p.m. L.M.T. 77W. 38N56. September 24, 1869, Black Friday in Wall Street, due to an attempt to corner gold (financial) broken (Pluto acts drastically) by action of the Federal treasury. 345. Chapter 5 (Serial Lesson 145), Jupiter conjunction Pluto, April 11, 1882, approximately 2:11 p.m. L.M.T. 77W. 38N56. April 3, 1882, Supreme Court holds that a State tax on telegrams is void so far as it is laid on interstate (Jupiter) messages or on those sent by Federal officials. 346. Chapter 5 (Serial Lesson 145), Jupiter conjunction Pluto, May 18, 1894, approximately 1:36 a.m. L.M.T. 77W. 38N56. April 29, 1894, Coxey’s Army (group) reaches Washington with a demand for the issue of $500,000,000 paper money (Jupiter). 347. Chapter 5 (Serial Lesson 145), Jupiter conjunction Pluto, June 26, 1906, approximately 5:43 a.m. L.M.T. 77W. 38N56. June 26, 1906, cable (Jupiter) between Japan and the United States is opened. 348. Chapter 5 (Serial Lesson 145), upiter conjunction Pluto, August 10, 1918, approximately 4:17 a.m. L.M.T. 77W. 38N56. August 27, 1918, Wilson places under the control of an Export Council (dictatorship) all articles of commerce (Jupiter) destined for neutral countries. 349. Chapter 5 (Serial Lesson 145), Jupiter conjunction Pluto, May 26, 1931, approximately 11:25 p.m. L.M.T. 77W. 38N56. May 27, 1931, at Paris the 25 American Mayors touring France established a council (dictatorship) to govern their tour (Jupiter) after a difference of opinion (Pluto splitting) had led to a dispute over the leadership of their tour. As Neptune rules visionary schemes, involved affairs, involuntary servitude and dramatic art; and Jupiter rules finance, commerce, interstate commerce, treaties, arbitration, the courts, salesmanship, publishing, advertising, cable messages, ships which travel the sea, long journeys, religion and public expression of opinion; the conjunction of Jupiter with Neptune attracts events in which factors related to both planets are combined. The following events are described in Chapter 2, Serial Lesson No. 142. 18. Chapter 2, Serial Lesson No. 142, Jupiter conjunction Neptune, December 29, 1804, approximately 11:35 a.m. L.M.T. 77W. 38N56. 19. Chapter 2, Serial Lesson No. 142, Jupiter conjunction Neptune, December 24, 1817, approximately 00.58 p.m. L.M.T. 77W. 38N56. 20. Chapter 2, Serial Lesson No. 142, Jupiter conjunction Neptune; December 15, 1830, approximately 4:52 a.m. L.M.T. 77W. 38N56. 21. Chapter 2, Serial Lesson No. 142, Jupiter conjunction Neptune; April 9, 1843, approximately 1:31 p.m. L.M.T. 77W. 38N56. 22. Chapter 2, Serial Lesson No. 142, Jupiter conjunction Neptune, March 17, 1856, approximately 1:23 a.m. L.M.T. 77W. 38N56. 23. Chapter 2, Serial Lesson No. 142, Jupiter conjunction Neptune; February 26, 1869, approximately 00:19 a.m. L.M.T. 77W. 38N56. 24. Chapter 2, Serial Lesson No. 142, Jupiter conjunction Neptune June 18, 1881, approximately 7:34 a.m. L.M.T. 77W. 38N56. 25. Chapter 2, Serial Lesson No. 142, Jupiter conjunction Neptune June 1, 1894, approximately 4:41 a.m. L.M.T. 77W. 38N56. 26. Chapter 2, Serial Lesson No. 142, Jupiter conjunction Neptune, May 22, 1907, 6:43 a.m. L.M.T. 77W. 38N56. 27. Chapter 2, Serial Lesson No. 142, Jupiter conjunction Neptune, September 23, 1919, 8:46 p.m. L.M.T. 77W. 38N56. 333. Chapter 2, Serial Lesson No. 142, Jupiter conjunction Neptune, September 18, 1932, 11:30 p.m. L.M.T. 77W. 38N56. As Uranus rules independence, reform, exposure, invention and the new and untried; and Jupiter rules finance, commerce, interstate commerce, treaties, arbitration, the courts, salesmanship, publishing, advertising, cable messages, ships which travel the sea, long journeys, religion and public expressions of opinion; the conjunction of Jupiter with Uranus attracts events in which factors related to both planets are combined. 33. Chapter 3, Serial Lesson No. 143, Jupiter conjunction Uranus, September 15, 1803, approximately 5:32 p.m. L.M.T. 77W. 38N56. April 30, 1803, Louisiana Purchase Treaty (U. S. pays France $15,000,000). 34. Chapter 3, Serial Lesson No. 143, Jupiter conjunction Uranus, November 9, 1817, approximately 11:40 p.m. L.M.T. 77W. 38N56. December 10, 1817, Mississippi admitted as slave state. Taken with Indiana, the first clear case of admission of free (Uranus) and slave states in pairs (attempt to settle a vexatious problem through arbitration). 35. Chapter 3, Serial Lesson No. 143, Jupiter conjunction Uranus, March 20, 1831, approximately 11:52 p.m. L.M.T. 77W. 38N56. March 18, 1831, in the Cherokee Nation v. Georgia the Supreme Court (Jupiter) denies the right of an Indian tribe to sue in the Federal courts, because it is not a foreign (independent) nation. 36. Chapter 3, Serial Lesson No. 143, Jupiter conjunction Uranus, February 8, 1845, approximately 9:16 a.m. L.M.T. 77W. 38N56. March 1, 1845, joint resolution of Congress for the annexation of Texas (giving independence from Mexico), less favorable to the United States than the abandoned treaty (Jupiter). 37. Chapter 3, Serial Lesson No. 143, Jupiter conjunction Uranus, May 23, 1858, approximately 9:10 a.m. L.M.T. 77W. 38N56. May 11, 1858, Minnesota free (without slavery) State. 38. Chapter 3, Serial Lesson No. 143, Jupiter conjunction Uranus June 5, 1872, approximately 0:52 p.m. L.M.T. 77W. 38N56. September 14, 1872, Geneva Tribunal, sitting under the Treaty (Jupiter) of Washington, awards the United States $15,500,000 damages against Great Britain. 39. Chapter 3, Serial Lesson No. 143, Jupiter conjunction Uranus, August 18, 1886, approximately 3:52 a.m. L.M.T. 77W. 38N56. August 2, 1886, Congress places a tax (financial levy) on oleomargarine; an early (Uranus innovation) pure food law. 40. Chapter 3, Serial Lesson No. 143, Jupiter conjunction Uranus October 20, 1900, 3:08 a.m. L.M.T. 77W. 38N56. 41. Chapter 3, Serial Lesson No. 143, Jupiter conjunction Uranus March 3, 1914, 10:13 p.m. L.M.T. 77W. 38N56. April 7, 1914, treaty with Colombia is signed by which Colombia recognizes Panama (Uranus-Jupiter in third, relating to transportation). 42. Jupiter conjunction Uranus, July 15, 1927, 3:37 p.m. L.M.T. 77W. 38N56..
July 15, 1927, Governor Small gave the State Treasurer of Illinois a check for $650,000 (Jupiter) in settlement of the judgment against him for an accounting (expose) of interest on State funds. 43. Chapter 3, Serial Lesson No. 143, Jupiter conjunction Uranus, August 11, 1927, 7:00 a.m. L.M.T. 77W. 38N56. August 11, 1927, thousands of Inca Indians (Jupiter-Uranus in house of war) have rebelled (Uranus) in the Pocoala region of Bolivia, armed with clubs and slingshots they are killing whites and burning farm houses. 44. Chapter 3, Serial Lesson No. 143, Jupiter conjunction Uranus, January 25, 1928, 1:27 a.m. L.M.T. 77W. 38N56. January 24, 1928, at Washington, Mahlon T. Everhart declared that in May 1922, Harry F. Sinclair delivered to him Liberty Bonds (Jupiter-Uranus in fifth) of a value of $233,000, all of which went to Fall (exposé). As Saturn rules safety, economy, poverty, minerals, basic utilities, buildings, crops on the land, destruction by storm, the miner, the farmer and the common laborer; and Jupiter rules finance, commerce, interstate commerce, treaties, arbitration, the courts, salesmanship, publishing, advertising, cable messages, ships which travel the sea, long journeys, religion and public expression of opinion; the conjunction of Jupiter with Saturn attracts events in which factors related to both planets are combined. 53. Chapter 5, Serial Lesson 145, Jupiter conjunction Saturn, July 16, 1802, approximately 6:52 a.m. L.M.T. 77W 38N56. April 24, 1802, Georgia cedes claims to all land (Saturn) west of present boundary. 54. Chapter 5, Serial Lesson 145, Jupiter conjunction Saturn, June 19, 1821, approximately 4:28 p.m. L.M.T. 77W. 38N56. Russian ukase claiming North American coast (land, Saturn) south to 51 degrees (this controversy over territory was the dominant topic most of 1821). 55. Tables at end of this chapter/lesson, Jupiter conjunction Saturn, January 25, 1842, approximately 10:52 p.m. L.M.T. 77W. 38N56. 56. Tables at end of this chapter/lesson, Jupiter conjunction Saturn, October 21, 1861, approximately 6:52 a.m. L.M.T. 77W. 38N56. December 31, 1861, general suspension (Saturn) of species (Jupiter) payments by banks; not resumed until 1879. 57. Tables at end of this chapter/lesson, Jupiter conjunction Saturn, April 18, 1881, approximately 10:18 a.m. L.M.T. 77W. 38N56. January 24, 1881, in Springer v. United States the Supreme Court (Jupiter) holds the Federal income tax of 1862 to be constitutional, not being a direct tax. 58. Tables at end of this chapter/lesson, Jupiter conjunction Saturn, November 28, 1901, 11:28 a.m. L.M.T. 77W. 38N56. November 18, 1901, Hay-Pauncefote Treaty (Jupiter) is signed; Clayton-Bulwer Treaty abrogated and British consent given to American sole control of the Isthmian Canal (Jupiter-Saturn sextile Mercury in ninth). 59. Tables at end of this chapter/lesson, Jupiter conjunction Saturn, September 9, 1921, 11:07 p.m. L.M.T. 77W. 38N56. September 8, 1921, jobless (Saturn lack) men, stripped to the waist, were offered in vain on an auction block on the Boston Common. They were offered for “sale” (Jupiter) to work for a week. As Pluto rules groups, cooperation, the splitting into two opposing factions, and the exercise of dictatorial powers; and Mars rules war, army and navy, law-enforcement officers, doctors, industrial workers, fires, vice, gambling, intoxicants, banditry, accidents and strife; the conjunction of Mars with Pluto attracts events in which factors related to both planets are combined. 354. Tables at end of this chapter/lesson, Mars conjunction Pluto, July 1, 1921, approximately 5:40 a.m. L.M.T. 77W. 38N56. June 30, 1921, President Harding signed Army (Mars) Appropriation Bill, reducing (Mars-Pluto in house of restrictions) army to 150,000. 355. Tables at end of this chapter/lesson, Mars conjunction Pluto, June 15, 1923, approximately 8:08 a.m. L.M.T. 77W. 38N56. June 15, 1923, the N. Y. Stock Exchange and the N. Y. Curb Market accepted identical resolutions for suspension or expulsion (drastic Pluto) of any member refusing to testify or produce his books in any legal proceeding, civil or criminal (Mars-Pluto in twelfth). 356. Tables at end of this chapter/lesson, Mars conjunction Pluto, May 28, 1925, approximately 10:26 p.m. L.M.T. 77W. 38N56. May 27, 1925, a special Grand Jury at Washington, D.C., reindicted Albert B. Fall, Harry F. Sinclair and Edward L. Doheny (Pluto group) on the charge of conspiracy to defraud the Government in the making of naval (Mars) reserve oil leases (Mars-Pluto sextile Mercury in fourth, and trine Saturn in ninth). 357. Tables at end of this chapter/lesson, Mars conjunction Pluto, May 10, 1927, approximately 8:59 p.m. L.M.T. 77W. 38N56. May 10, 1927, a group (Pluto) of armed men overpowered guards and dynamited (Mars) the Los Angeles Aqueduct, tearing out a large section of pipe (Mars-Pluto in house of open enemies of people). As Neptune rules visionary schemes, involved affairs, involuntary servitude and dramatic art; and Mars rules war, army and navy, law-enforcement officers, doctors, industrial workers, fires, vice, gambling, intoxicants, banditry, accidents and strife; the conjunction of Mars with Neptune attracts events in which factors related to both planets are combined. 109. Tables at end of this chapter/lesson, Mars conjunction Neptune, August 25, 1921, 7:40 a.m. L.M.T. 77W. 38N56. August 25, 1921, 5,000 armed coal miners (Neptune ruling house of labor) start from Mannet, W. Va. to unionize the Mingo mine district. They desisted at U. S. warning (Mars). 113. Tables at end of this chapter/lesson, Mars conjunction Neptune, August 12, 1923, 10:04 p.m. L.M.T. 77W. 38N56. August 11, 1923, German Socialists (Neptune) split from Chancellor Cuno. A score were killed (Mars) in strikes and food riots throughout the country. 117. Tables at end of this chapter/lesson, Mars conjunction Neptune, July 30, 1925, 2:30 p.m. L.M.T. 77W. 38N56. July 30, 1925, C. H. Schwartz blew up the company’s plant at Walnut Creek, Calif., killing an itinerant laborer whose body he tried to have identified as his own in a plot (Neptune) to get $200,000 insurance. 121. Tables at end of this chapter/lesson, Mars conjunction Neptune, July 17, 1927, 9:41 p.m. L.M.T. 77W. 38N56. July 17, 1927, fighting (Mars) between 500 Nicaraguans and 40 U. S. Marines and 5 bombing planes (Neptune) has resulted in the death of 300 rebels and 1 marine. As Uranus rules independence, reform, exposure, invention and the new and untried; and Mars rules war, army and navy, law-enforcement officers, doctors, industrial workers, fires, vice, gambling, intoxicants, banditry, accidents and strife; the conjunction of Mars with Uranus attracts events in which factors related to both planets are combined. 112. Tables at end of this chapter/lesson, Mars conjunction Uranus, December 25, 1922, 5:39 a.m. L.M.T. 77W. 38N56. 116. Tables at end of this chapter/lesson, Mars conjunction Uranus, November 27, 1924, 3:12 p.m. L.M.T. 77W. 38N56. November 27, 1924, the Republican Senate Caucus resolved that Senators La Follette, Ladd, Brookhart and Frenzier be not invited (Uranus-Mars in house of Congress) to future Republican conferences. 120. Tables at end of this chapter/lesson, Mars conjunction Uranus, June 13, 1926, 5:47 p.m. L.M.T. 77W. 38N56. June 13, 1926, 12 were killed by coke oven explosion at Illinois Steel Co.’s plant (Mars-Uranus in fourth) at Gary, Indiana. As Saturn rules safety, economy, poverty, minerals, basic utilities, buildings, crops on the land, destruction by storm, the miner, the farmer and in the common laborer; and Mars rules war, army and navy, law-enforcement officers, doctors, industrial workers, fires, vice, gambling, intoxicants, banditry, accidents and strife; the conjunction of Mars with Saturn attracts events in which factors related to both planets are combined. 110. Tables at end of this chapter/lesson, Mars conjunction Saturn, November 13, 1921, 4:13 a.m. L.M.T 77W. 38N56. November 14, 1921, 11 died in fire on W. 17th St., New York. 114. Tables at end of this chapter/lesson, Mars conjunction Saturn, December 1, 1923, 2:58 a.m. L.M.T. 77W. 38N56. November 28, 1923, in the 1923 hunting season 20 persons were accidentally killed in N. Y. State. 118. Tables at end of this chapter/lesson, Mars conjunction Saturn, December 14, 1925, 5.24 p.m. L.M.T. 77W. 38N56. December 15, 1925, “Battling” Siki (Louis Phal) Senegal boxer (Mars-Saturn in fifth), was shot and killed in New York City. 122. Tables at end of this chapter/lesson, Mars conjunction Saturn, December 26, 1927, 7:44 a.m. L.M.T. 77W. 38N56. December 26, 1927, the bruised and strangled body of Amelia Appleby was found sewn in a sack just outside of Los Angeles. 8:42 P.M. L.M.T., Washington, D.C.
At the time the U. S. was attending a Nine-Power Parley (Jupiter) in Europe (Mars-Jupiter in seventh), in the futile attempt to halt Japanese invasion of China. Japan flaunted the parley, became aggressive (Mars) toward the U. S., and within six weeks sunk the U. S gunboat Panay. Germany demanded return of her colonies. Italy withdrew from the League of Nations, and a military alliance (Mars-Jupiter opposition Pluto) was formed by Japan, Italy and Germany. As Jupiter rules finance, commerce, interstate commerce, treaties, arbitration, the courts, salesmanship, publishing, advertising, cable messages, ships which travel the sea, long journeys, religion and public expression of opinion; and Mars rules war, army and navy, law-enforcement officers, doctors, industrial workers, fires, vice, gambling, intoxicants, banditry, accident and strife; the conjunction of Mars with Jupiter attracts events in which factors related to both planets are combined. 111. Tables at end of this chapter/lesson, Mars conjunction Jupiter, November 26, 1921, 9:28 p.m. L.M.T. 77W. 38N56. November 21, 1921, Premier Briand at Arms (Mars) Conference (Jupiter) said France was not militaristic, but needed protection against Germany. 115. 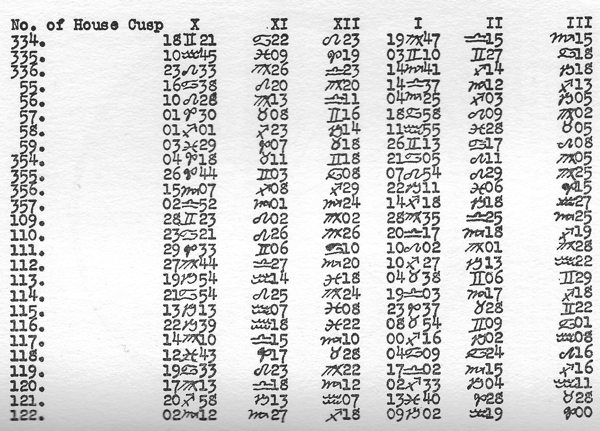 Tables at end of this chapter/lesson, Mars conjunction Jupiter, February 13, 1924, 9:28 a.m. L.M.T. 77W. 38N56. February 12, 1924, agreement for a $150,000,000 loan (Mars-Jupiter in house of debt) to Japan was signed at J. P. Morgan’s home at N. Y. City. 119. Tables at end of this chapter/lesson, Mars conjunction Jupiter, April 23, 1926, 5:20 p.m. L.M.T. 77W. 38N56. April 23, 1926, hazers in a theater play (Mars-Jupiter on cusp of fifth) broke the neck of Ralph MacKenzie, actor, when they tossed him up in a blanket. Illustration above, Mars conjunction Jupiter, October 29, 1937, 8:42 p.m. L.M.T. 77W. 38N56. October 29, 1937, the U.S. was participating at this time in a futile Nine-Power Parley (Jupiter) in Europe, in the hope of halting Japanese aggression in China. Japan flaunted the parley and became aggressive toward the U. S. (Mars-Jupiter in seventh). Germany made new demands for return of her colonies; Italy severed relations with the League of Nations; and while the aspect was operative a military alliance (Jupiter-Mars opposition Pluto) was formed by Japan, Italy and Germany.